LONDON--(BUSINESS WIRE)-- Technavio analysts forecast the global clinical mass spectrometry market to grow at a CAGR of close to 8% during the forecast period, according to their latest market research report. The growth momentum of the market is expected to accelerate in the year-over-year growth. 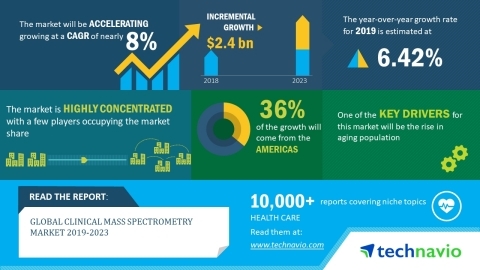 The increasing demand for clinical mass spectrometry in personalized medicine is one of the major trends being witnessed in the global clinical mass spectrometry market 2019-2023. Personalized medicine refers to providing medical treatment according to the individual characteristics of patients and offers the potential to detect diseases at an earlier stage when treatment can be effective. Personalized medicine increases the quality of clinical practice and targeted care pathways and ultimately reduces the overall healthcare costs. There is a growing popularity of using clinical mass spectrometers in the development of personalized medicine for the early detection of diseases and the selection of accurate treatment methods that can reduce mortality rates. Such developments will drive the growth of the market. The increase in median age due to the increase in life expectancy has resulted in an increase in the aging population globally. As the elderly generally have low immunity and metabolism, they need to undergo diagnostic tests such as microbial testing on a regular basis. This results in an increased demand for clinical mass spectrometry that reveals details about the casual microorganisms, based on which, the physician decides the best course of treatment. The global clinical mass spectrometry market research report provides market segmentation by end user (healthcare and clinical research laboratory) and by region (the Americas, EMEA, and APAC). It provides an in-depth analysis of the prominent factors influencing the market, including drivers, opportunities, trends, and industry-specific challenges. The Americas held the largest share of the market in 2018, accounting for more than 41% share. It was followed by EMEA and APAC respectively. The Americas owns the largest share of the market owing to the increase in the number of research studies for discovering new therapies for diseases such as cancer.